St. Francis’s feast day (Oct. 4) is not included in the list of major feasts of the Episcopal Church. But many local parishes observe the day, and here at Grow Christians, we do too. Last week we provided some ways you and your family can celebrate this feast together. Today, we reflect on its meaning. -Ed. 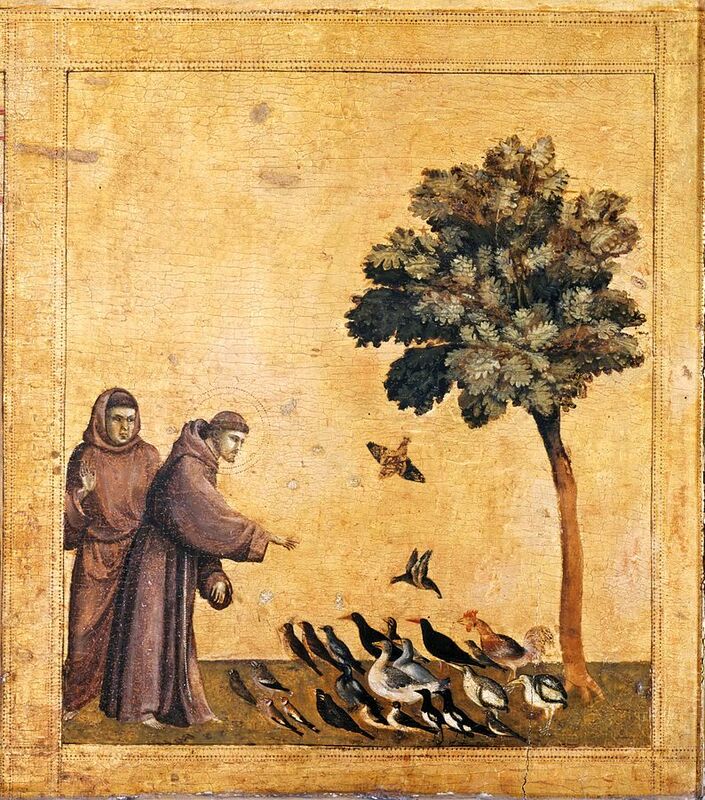 St. Francis is often imaged as a meek and mild man, preaching to–and scattering food for–a flock of birds. This has been true for centuries. The image below is seven hundred years old. Our understanding of St. Francis’s oneness with all Creation continues from that day to this. 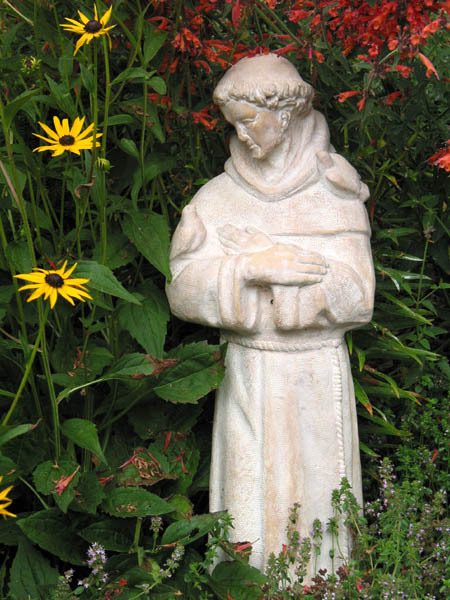 Here’s a contemporary picture of a lovely St. Francis garden statue. Across seven centuries, St. Francis’ image remains constant. He has been befriended by the birds of the air: a sign of his closeness to God. But St. Francis is more than the garden-statue saint usually imaged. We may be used to the idea that the creatures of the earth broke boundaries to be near him. But St. Francis was a boundary-breaker too. The image below is titled “St. 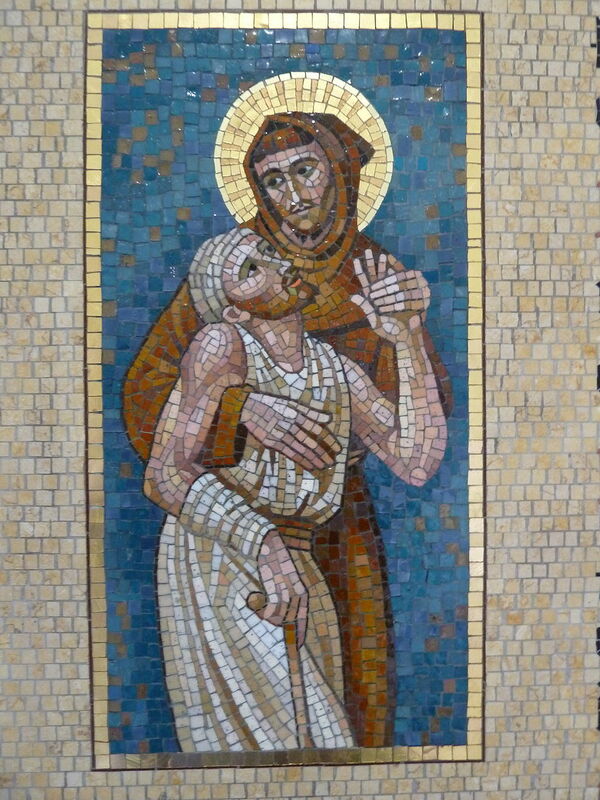 Francis and the Leper.” As I look at it, I can’t help but see all who suffer from illness and stigma simultaneously: doubly vulnerable, doubly challenged, yet still with gifts to share. he moved to a hospice of lepers, taking with him a large sum of money. Calling them all together, as he kissed the hand of each, he gave them alms. When he left there, what before had been bitter, that is, to see and touch lepers, was turned into sweetness… [Before this, if] he happened to come near their houses or to see them, even though he was moved by piety to give them alms through an intermediary, he always turned away his face and held his nose. I’m relieved to know this side of St. Francis. I’ve never been the kind of person on whom a bird would perch. But I’ve certainly found myself relating to people I once tried to avoid. When we decide to follow Jesus, God has a way of bringing us face-to-face with all His children. Some are people who once made us want to hold our noses and turn away. Some of those people might be in our own family. Others are certainly our neighbors. In the election season, we’ve reached that point where each side wants to hold our nose and turn away from the others. But all of us are children of God. St. Francis knew that. So may we. Most high, omnipotent, good Lord, grant your people grace gladly to renounce the vanities of this world; that, following the way of blessed Francis, we may for love of you delight in your whole creation with perfect joy; through Jesus Christ our Lord, who lives and reigns with you and the Holy Spirit, one God, for ever and ever. Do you have any images of St. Francis? What side of the saint do they show?